The class System::Thread can be used to spawn a new thread. To do so, we create an inner class and derive it from System::Thread. For this class we define a constructor, a destructor and overwrite the method Run(). Attention! To prevent the release of a thread object while it is running, it is strongly advised to implement a destructor which calls the methods Stop() and Join(). Now we can start and stop our new thread with the methods Start() and Stop() respectively. The method Join() blocks the calling thread until the thread finishes its execution and needs to be called before the thread can be restarted. Our new thread can be started and stopped with T (key press or button press) and simply prints every 100 ms a point character into the debug window. The class System::Semaphore implements a binary semaphore and provides the methods Signal(), Wait() and Try(). Wait() blocks the current thread until Signal() is called (optionally with or without timeout). Try() checks if Signal() has been called but does not block the current thread. For example, we can use a semaphore to determine if a thread has been finished its execution. The thread can be started with S and prints a info message into the debug window when the thread has finished. A mutex (mutual exclusion) can be used to specify critical sections. Thus, it can be ensured that no two concurrent threads are in a critical section at the same time. The class System::Mutex provides the methods Lock() and Unlock() for this purpose. The class System::Locker is a useful helper class for mutex objects. A System::Locker object automatically calls the Lock() method at object creation and automatically calls Unlock() when the Locker object goes out of scope. If a critical section is turned into a method and a System::Locker object is used to lock the mutex, it is assured that in any case the Unlock() method is called automatically when the method call ends. A System::AtomicSInt32 class can be used to create an atomically counter without the need of an extra mutex object. We can e.g. use the System::AtomicSInt32 class for a progress bar. The thread can be started and stopped with P. The progress is visualized with the mPlane object. The class Util::MessageThread implements a thread with Util::MessageQueue and Util::MessageDispatch objects. The class can be used to write your own message dispatcher. To create a simple example, we define at first two message classes derived from Util::Message. Next, we need a Util::MessageThread class. We use Register() to specify which method should process which message. The methods SendMessage() and SendSyncMessage() can be used to send a message. If a message is received it is evaluated and the corresponding receive method is called. 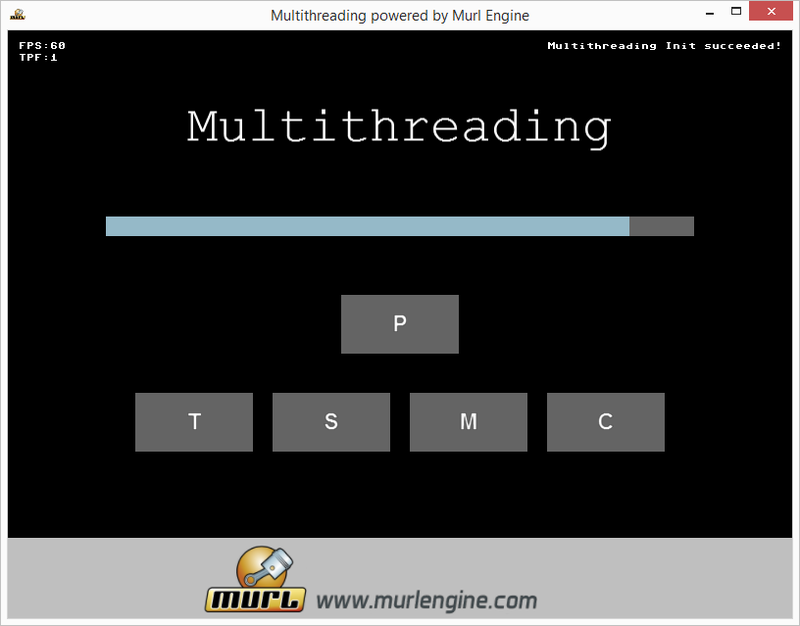 The test sequence can be started with M.
C++11 provides new support for threads, atomic variables, mutexes etc. If only platforms with modern compilers and C++11 support are used, alternatively the new C++11 features can be used for multithreading. The class std::thread can be used to spawn a new thread. The function which should be executed by the new thread is passed as parameter (line 273). If a member function should be executed, a pointer to the member function and the object needs to be passed as parameters (lines 274-276). By default the thread constructor will copy all arguments passed to it. To pass a variable by reference, the passed arguments must be wrapped into std::ref or std::cref (line 276). Attention! To be able to use C++11 features with the Android NDK, it is necessary to set the C++11 compiler flag in the Makefile (APP_CPPFLAGS += -std=c++11). If the NDK version is older than revision 10d, additionally the NDK_TOOLCHAIN_VERSION must be changed to NDK_TOOLCHAIN_VERSION=4.8 or NDK_TOOLCHAIN_VERSION=clang (default is GCC 4.6). GCC 4.8 is the default compiler for all 32-bit ABIs since Android NDK, Revision 10d.